Aria Dean’s sculptures and videos examine our relationship to words and the way objects and people come to represent and exercise certain ideologies. 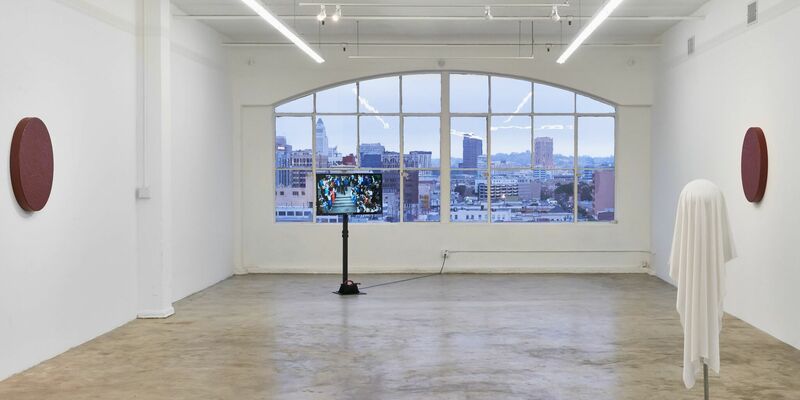 In her solo show “lonesome crowded west,” which is on view at Chateau Shatto in Los Angeles until October 27, 2018, she looks at the dialectic between the individual and the crowd, as she discusses below. THE NAME OF THIS SHOW is adapted from the title of the indie rock band Modest Mouse’s sophomore album. The work, all made this year, explores the paradox of the “lonesome crowd,” my idea of being “alone together” in virtual space as a way to access the subjectivity that characterizes black existence. The work has come out of an ongoing interest in the ontological and phenomenological structures of black being, and out of a desire to make art that models or draws on these same structures. This idea of haunting runs through the whole show, especially via the sculpture Summer Ghost, but also through the concept of “torqued seriality,” taken from Fred Moten’s interpretation of Édouard Glissant, in which objects and images exist in relation to each other in a way that troubles their individual presences. Another set of sculptures, “Forward Proxy 1.1; 1.2; 1.3; 1.4; 1.5,” draws on this idea. I’m interested in how they can antagonize value and the boundedness of sculptural art objects. Can these individual sculptures exist together as something other than an edition? Can they all be the same, yet different? The “Forward Proxy” series grapples with the questions and anxieties I have about the relationships between the artist, object, and audience. I’ve realized that my practice is driven by an interest in examining the conditions under which certain objects are seen, à la Robert Morris. For me, the “objects” are artworks, me, and other subject-objects like me. The “condition” is blackness. So, the sculptures, Minimalist in facture, address this, as they teeter between the personal and a more objective and materialist approach to history. They’re made of clay from southern Mississippi, a few hours away from where my paternal grandfather grew up. The pieces are historical without capitulating to frameworks of “narrative,” “self-expression,” and “experience” that are so readily applied to the work of black artists. This show feels like the first time that I’m fully addressing those approaches head-onnot simply refusing them, but turning them against themselves.